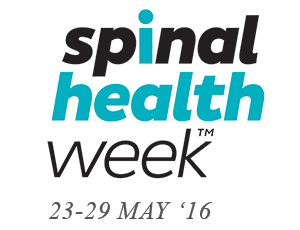 This month the Chiropractors’ Association of Australia is using this year’s Spinal Health Week, held between the 23rd-29th of May, to remind all Australians that they don’t have to be sporting professionals to achieve peak performance. The main message that we as a profession are focussing on is that everyone can “Back Their Inner Athlete”, by improving spinal function, reducing pain, maintaining healthy posture and taking care of one’s general health. With the Olympics around the corner, Rio will host over 10,500 athletes from 206 countries, who are currently in intensive training to perform to their optimum. This year’s Spinal Health Week’s “Back Your Inner Athlete” campaign reminds all Australians that everyone can back their own inner athlete and perform to their peak by doing simple things. The 2016 campaign also aims to help Australians understand that chiropractors are there when they need them and that patients can live better with chiropractic care, which can assist with improving overall health. Whether this is for treatment of an injury, or purely for a check-up and to maintain mobility. According to the World Health Organisation (WHO), inactivity is a global public health problem. WHO has indicated that globally around 31% of adults aged 15 and over were insufficiently active in 2008 (men 28% and women 34%). In addition approximately 3.2 million deaths each year can be attributed to insufficient physical activity’1. The WHO has attributed overall physical inactivity partly due to insufficient participation in physical activity during leisure time and an increase in sedentary behaviour during occupational and domestic activities. Likewise, an increase in the use of “passive” modes of transport has also been associated with declining physical activity levels. Through the ‘Back Your Inner Athlete’ campaign, the Chiropractors’ Association of Australia would like to support the initiative of the WHO to achieve a voluntary global physical activity increase by 10% by 2025. How can you “Back your inner athlete. Just follow these three P’s, chiropractic care can help support you to Back Your Inner Athlete , which, in conjunction with a healthy lifestyle can help activate performance. Reduce Pain – ‘Chiropractic adjustments can help to reduce spinal related pain. In the western world, 80% of the population will experience disabling low back pain during their life. Back pain can be caused by poor posture, seating issues, ligamentous injury, incorrect lifting or even lack of exercise. Neck pain is the second most common reason patients seek chiropractic care and can be caused by poor posture, stress, poor hydration, and bad sleeping conditions. Research has demonstrated that back and neck pain can be resolved when normal function has been restored to the spine. Maintain Posture – Use chiropractic care to understand how to manage and improve posture. Poor posture is often the result of sedentary positions, such as office work or extended use of computers and mobile devices. Poor posture places extra pressure on the spine which can lead to tension, soreness, back pain and even headaches. Chiropractors can assess posture, offering Chiropractic care to help an individual maintain better health in the long term along with recommending exercises to strengthen and maintain posture. Activate Performance – By placing importance on good spinal health and function, alleviating pain, improving posture and mobility, and living a healthy lifestyle, one can improve performance in life. In addition by building one’s core strength, deep core muscles provide stability and protection for one’s spine as well as maintain good spinal function. So as you go about your day today, remember to BACK YOUR INNER ATHLETE.